8 Ways To Save On School Lunches! 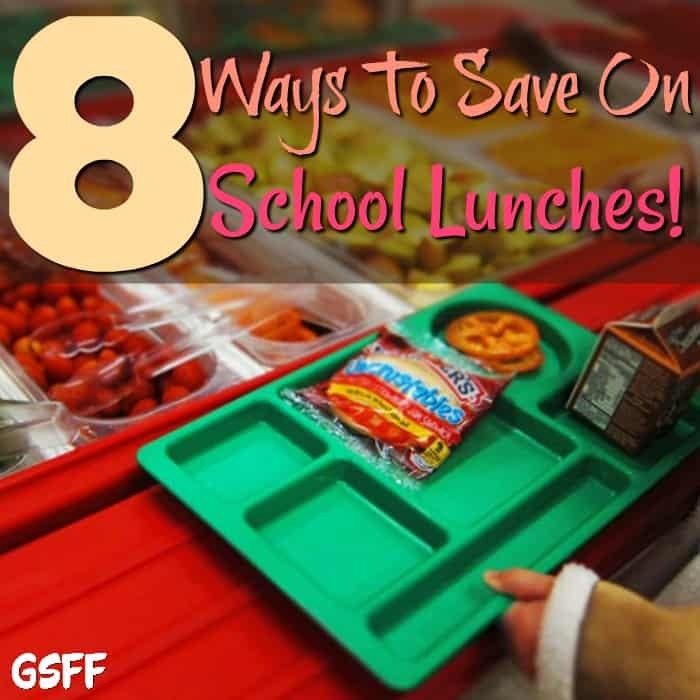 You are here: Home / Family Living / 8 Ways To Save On School Lunches! My good friend Shelly was sweet enough to help me while I am away at Bloggy Bootcamp – she has written a great guest post about how to save on school lunches!! Thanks, Shelly!! I am a teacher, so I see a ton of things during lunch that would make the average person cringe. That being said, I have been able to come up with some ideas for saving you money on your child’s lunch. Many school lunches are based on a fixed base price, so unless they are really hungry, request that your child does not buy an extra entree or side. I had a young man at school buy 3 entrees and barely finish 1 1/2 of them. His parents paid for 3 lunches that day. Many cafeterias still sell snack type items and even ice cream at lunch. At my school, a parent can actually block the child’s account for them to not purchase these items. I know it may seem mean, but many times the kids eat an ice cream bar and a cookie instead of their lunch. And they pay for the whole lunch. Don’t buy individually wrapped items, unless they are free. It is usually cheaper to buy a whole bag of chips, pretzels, cookies, etc. than to buy individually wrapped ones. The same goes for fruit and veggies. Check out Snack Taxi’s or Lunch Skins to save on the price of plastic baggies and the waste. Use leftovers, if your child likes them. I can still picture one of my students loving every bite of some of her mom’s leftovers. Just be aware that many schools won’t allow students to reheat things. Don’t over pack. Send only what your child might normally eat at home. I can’t tell you how much food I see wasted every day, and most of it is the healthy stuff. Pack unconventionally. If you child hates sandwiches, don’t force them on him or her. Think about other sources of energy like healthy crackers, yogurt, fruit, nuts, etc. Invest in a good thermos that doesn’t leak. It will save a ton of money on drinks/juice boxes. Are you a lunch packer? Or does your child eat school lunch? What are your tips for saving? Shelly is a full-time fourth grade teacher and blogs at Coupon Teacher. She wants you to share and celebrate your successes with her, and she may give you a few tips along the way! Right now, she is offering a free savvy shopping course. She would love for you to join her! Thanks for allowing me to guest post! School lunches… such a topic at our house. I pack for one of my children 100% of the time. According to him the food at his school is deadly. 🙂 He is a bit on the dramatic side. Child two- he likes that a home packed lunch keeps him full longer, but it is cool to stand in line with his friends and get a hot meal. But, if he eats a cafeteria lunch he is starving by 3:00. We pack the same things over and over again. They like it that way- very predictable. I do pack an extra cereal bar or granola bar to have for a snack later in the school day. My oldest is at school until 5:00 three days a week. Blocking the junk foods from the cafeteria checkout is a must!! We have accounts set up where they are only allowed to purchase ice cream once per week. No exceptions. They kinda live for Fridays.